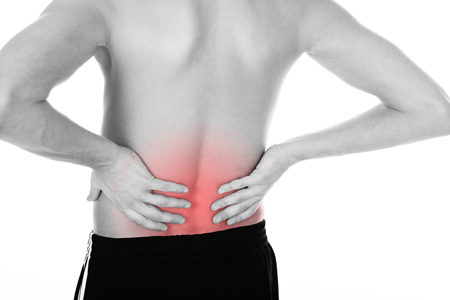 All causes of low back pain occur when any given tissue becomes over-stressed or compromised via excessive load. Excessive load often occurs from prolonged periods of sitting or rounding of the lower back while doing yard work or bicycling. Unless a traumatic accident has occurred, without treatment, lower back pain will become a chronic problem because the mechanics of the body have been compromised by activities of your daily life. Current research supports that most individuals will experience back pain at some point in their lives. Research indicates: 40% of individuals will experience pain in any given year, and 80% within their lifetime. Lower back pain symptoms can range vastly depending on the specific nerve fibers stimulated. The experience of pain may range from intermittent, sharp and stingy to a constant, dull ache. Low back pain can also create unpleasant sensations experienced elsewhere in the lower or upper body, depending on the mechanism of injury and type of tissue damaged (i.e. muscles, ligaments, tendons, bone, fascia, or nerves). Different symptoms and location of symptoms will correspond with the different damaged tissues. To help your doctor at ICT Muscle & Joint Clinic properly identify which structures are damaged, please be aware of and able to describe the type of pain present, its frequency and which activities increase pain. At ICT Muscle & Joint Clinic, we focus on treating the symptoms and root cause of your pain. The body is a dynamic, mobile structure and must be assessed and treated as such to create successful, long-term outcomes. We employ the best scientific, evidence-based, treatment procedures using a combination of chiropractic manipulation, soft tissue therapy, and rehabilitative exercises. Surrounding all joints, there must be a balance between tension and compression of the ligaments, muscles, tendons, and fascia; when pain is present, it is due to an imbalance of these structures. This requires mobilization and release of tight structures, in addition to strengthening weak or inhibited structures of the painful joint(s) as well as the joint(s) above and the joint(s) below. Low back pain is often the consequence of improper postural dynamics of the lower back and also lack of proper motion of the hips and mid-back. Our doctors focus on a comprehensive approach geared toward lasting results.